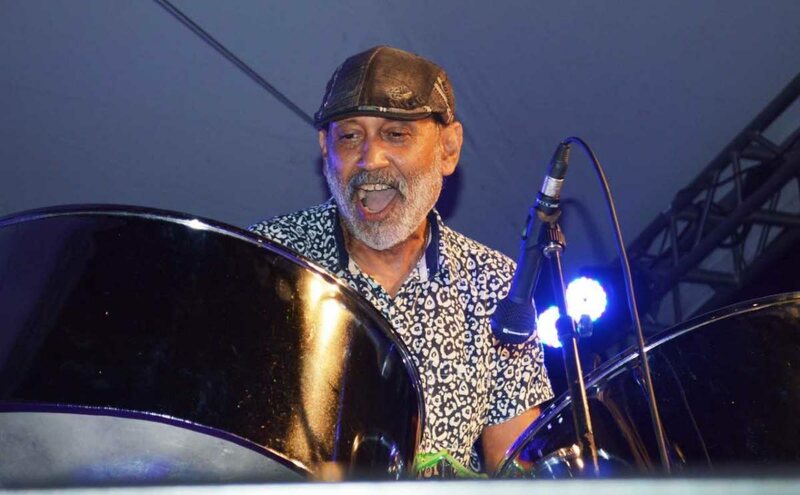 FOR 44-years Douglas "Dougie" Redon has distinguished himself in the music industry as a spontaneous and soulful jazz man who has performed with many of the country's best musicians. On Sunday, Redon will have a pan jazz concert called Dougie Redon's Pan Jazz at the The Little Carib Theatre, Roberts Street, Woodbrook. He describes the show as a Latin kaiso fusion concert intended to be a celebration of Carnival. This concert is also part of Little Carib's 70th-year anniversary celebration. "I will be performing original pieces with an infusion of calypso, Brazilian and Latin music, all fused with elements of jazz," he told Newsday in an interview at Little Carib. He will be performing with his band, Tamba Gwindi on percussion, Richard Joseph on drums, Russel Durity on bass and Chantal Esdelle on keyboards. All of whom he describes as well-known and competent musicians. Tickets for the show are already sold-out. He's certain the audience would not know what to expect when they attend the pan jazz show because he's not sure what notes will move him when on stage. "You could practise your performance as much as you want home, but music is the choice of notes and your improvisation of notes. Improvisation is spontaneous. When you're live, the music takes you to a different level," he said. Redon will be performing five original compositions. While he didn't want to reveal too much about his new music, he said one of the songs is called One For Silver, in honour of Horace Silver – a 1950s American jazz player. "Horace Silver's music is a soulful/jazzy style which I like. His improvisation is simple and well thought of. I am not really a lyrical musician. I may have some ideas but for me a melody is more important. Someone may have lyrics for a song but they still need a melody," he said. Redon, who is currently working on a CD, takes music composition very seriously. To him there are two different approaches to composing songs. Vocalists will compose first and find melodies to put to them. are two of Redon's biggest inspirations. guitar. Back then he used to play double tenor, now he plays double seconds pan. He played with Phase II ever since, however, this year he will take a break from Panorama. "I am still affiliated with Phase II as Boogsie is a very good friend of mine and we also have a very good musical relationship. We toured together. I play bass for him. This year I am not playing in Panorama. I play from time to time I am just taking a rest," he said. Redon is also in awe of Zanda, a man he dubs the father of kaiso jazz. "Clive Zanda is one of the best. He used to have a workshop in Curepe. His style of playing, he fused swing with bebop and kaiso, it's improvisation," he said. Antigua Jazz Festival and at the Barbados Caribbean Jazz Festival both in 1990. He still plays with him on occasion. "Boogsie and Zanda are the ones who I played with so I automatically became aware of their arrangements and style of playing. Their improvisation is well laid out and constructive. It could also take you anywhere. It's spontaneous," he said. Redon is a full-time musician who works year-round entertaining jazz lovers. While he loves to play the pan, he gets paying gigs more from playing bass guitar. "I'm a freelance musician even though I play with these bands. Unfortunately, I get more engagements playing the bass rather than the pan as most pannists have tracks backing their music which is more feasible for their client," he said. Being a full-time musician is difficult and Redon experiences times when there are no paying gigs available. During that time, he would practise. He is a founding member of a blues band called Tabanka comprising of Danish vocalist and guitarist Anders Kappel, Roger Guerra on drums and pianist Ronald Aqui. He plays bass guitar in the group Moyenne with Esdelle. And he has recorded with Theron Shaw quartet. Andre Tanker at the 2000 St Lucia Jazz Festival, and with Esdelle at the Cuba Jazz Plaza International Festival. "I played with nearly everyone in Trinidad. The most I played with is Boogsie," he said. He also has very strong opinions regarding the rundown of music for soca 2019. His favourites are Farmer Nappy's Hookin Meh, Nadia Batson's So Long, Patrice Robert's This Is De Place and Savannah Grass by Kes The Band. However, he is not a fan of most soca music out there. "There are only a few good songs. Plenty of the fast songs sound the same. They take lines from other songs and they sing. It sounds like you've heard it before," he said. Iwer George's Mash Up, he said is one such song. "I've heard it already. Same style. Young fellas sound like they are trying to emulate big names. If you are doing something you should be original. Kes is original. Patrice is original. Farmer Nappy is original," he said. Reply to "Redon’s pan jazz comes to Little Carib"